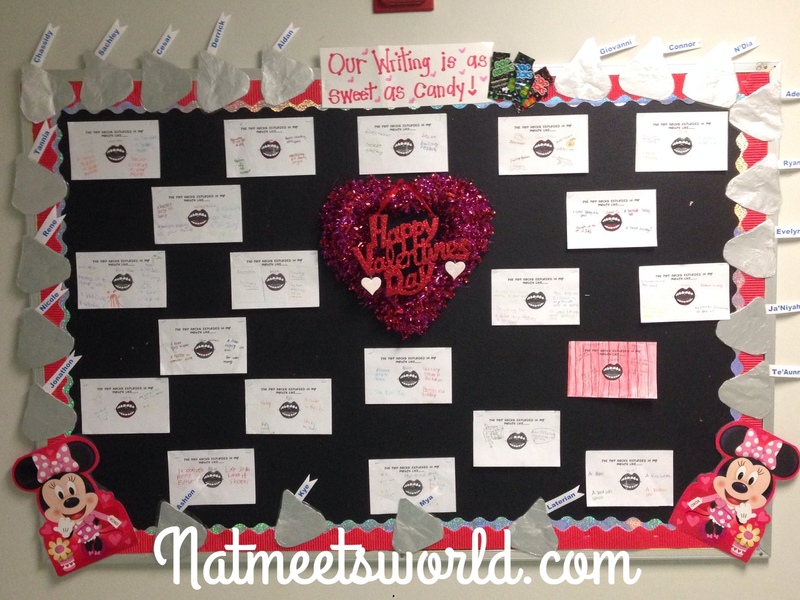 Since Valentine’s day is right around the corner, it was time to work on similes with my little love bugs in my class. I usually do this activity around this time of the year because Valentine’s day always includes candy, but you can use this anytime of the year to practice similes. I start with a brief discussion about similes and review some ‘boring’ non-examples. I then emphasize the importance of coming up with exciting words when writing similes so that they can understand the difference between a boring one and a great one. 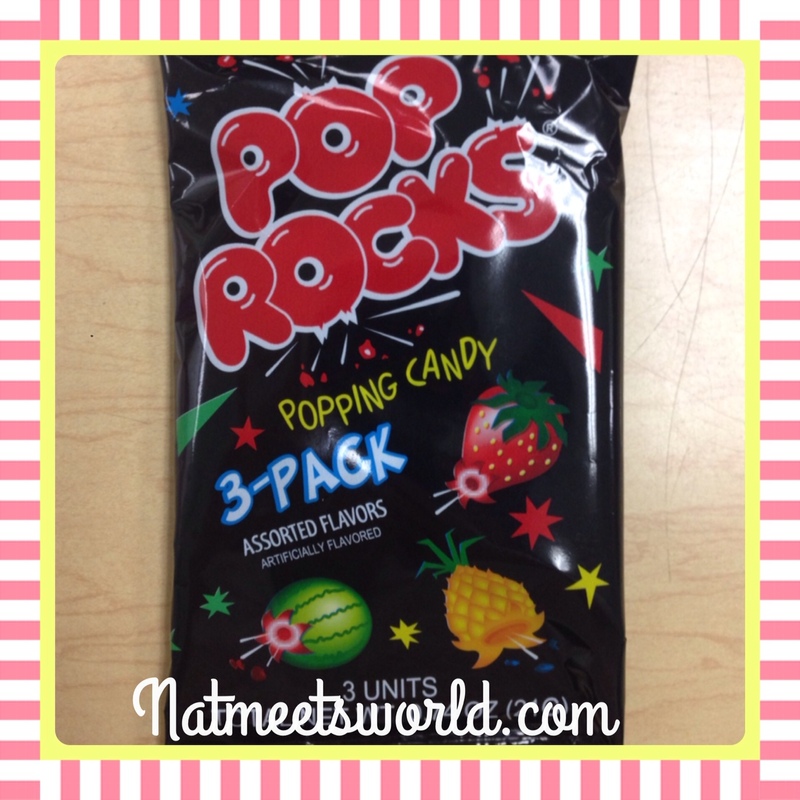 After this, I hand out some Pop Rocks for students to indulge in and experience. This was one of my favorite candies in the 90’s , and many kids have never tried it, so it’s always fun to see their faces after they have a taste. The best part is that you can get a 3 pack at the Dollar Tree for only $1.00! It’s a very inexpensive lesson to do as a teacher, or even at home with your own kids. 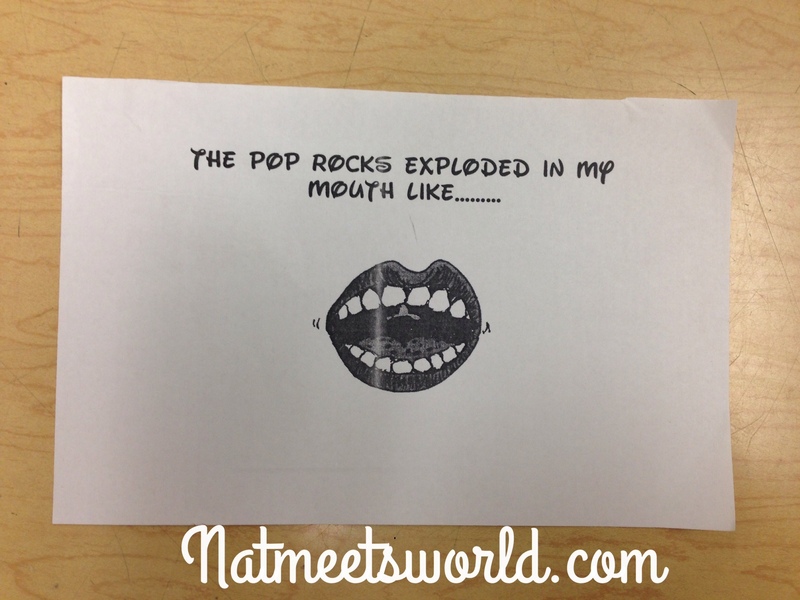 Once they have enjoyed their pop rocks, I give them a template (below) that I made to compare the feeling of the pop rocks in their mouths with other real life things that ‘pop’. My little love bugs did a great job with this, and I was really impressed with their choice of words. You can use different candies if you prefer, but remember that it must have an impact to their senses in order for them to create a meaningful simile. I also used this activity as my bulletin board theme for the month of February. I also printed a large picture of a Hershey Kiss and traced it 23 times (number of students that I have) on a manila folder. After cutting them all out, I wrapped them in aluminum foil and laminated them. To match the famous little white strip that sticks out of every kiss, I printed each students name in light blue and taped it to the back of each kiss. This way, I can just remove the name easily, and reuse them next year. Since there are 23 of them, I made a border around our board with it. 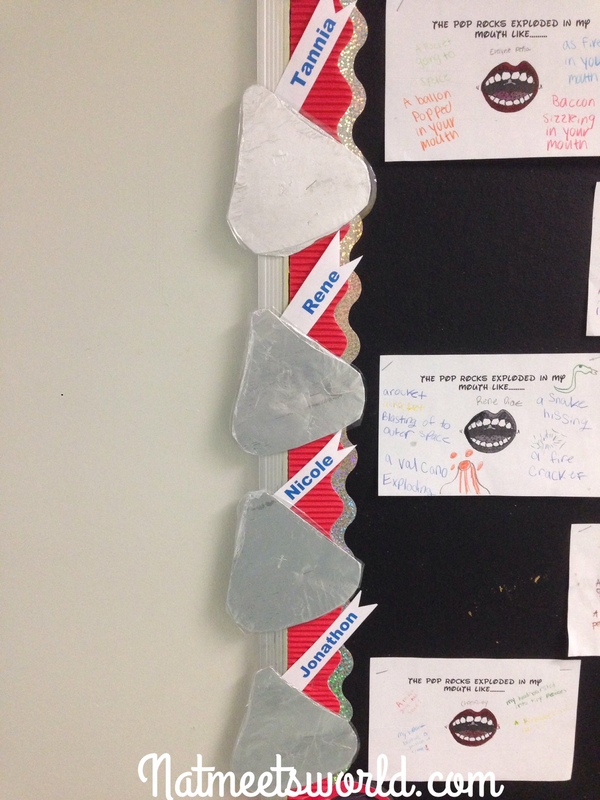 Close up of the kisses on the bulletin board. 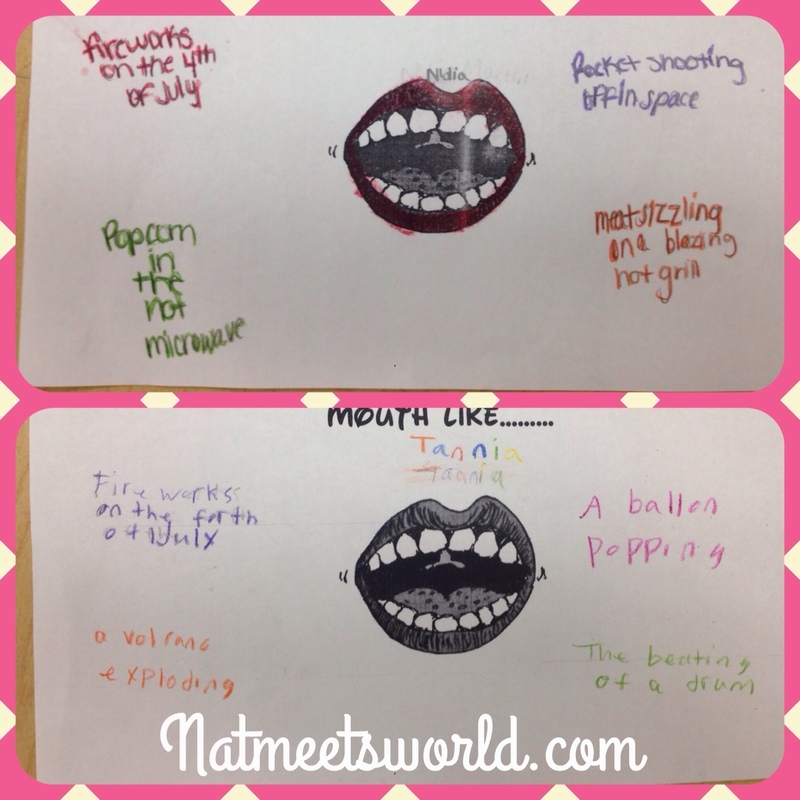 Enjoy trying this in the classroom, or at home if you’re a mommy or daddy!